The subject of astronomy was not the chosen discipline for Tycho. He, like other young nobles of his day, began a Latin education which was to be followed until he was 12 years old. That choice however, was made by his uncle, not his father. In a strange incident that seems to have stemmed from an earlier family agreement, and which resulted in outright kidnapping, Tycho was quickly and quietly "taken" away from his parents by his uncle, a Danish nobleman named Jørgen Brahe. In April of 1559, Tycho began his studies at the University of Copenhagen. His enrollment there was for the study of jurisprudence, philosophy and rhetoric, the preferred education for those whose career would eventually take them into the courts of nobility. But events, and one in particular, would transpire to change this career path, much to the chagrin of his family and unclethough one might say, happily for science for at the end of August 1560, there occured in the skies of Europe a partial solar eclipse. Shown at left is the University of Copenhagen courtesy the Niels Bohr Institutet. The solar eclipse of 31st August 1560 at 7° Virgo 51' was total in the extreme west of Europe. At Copenhagen it was partial but still attracted Tycho's attention. Astrology was an everyday topic of conversation amongst his fellow students and Tycho's interest was aroused. When he saw the eclipse take place at the predicted time, it struck him as miraculous that the motions of the planets could be forecast so accurately. He immediately acquired an ephemeris and the complete works of Ptolemy and set about learning how it was done. Few are those that by design or chance, more accurately map out the exact course the rest of their life will take. So it is only the more remarkable that Tycho, investing a little more than a few yearsthe rest of his lifewould pursue exactly what he had written as a teenager of just 17 years. In March of 1562 Tycho Brahe walked through the doors of Leipzig University, a student of law, as his uncle had wished. With him was priest, historian and tutor Anders Sørensen Vedel. But in 1595 he walked out of Leipzig an astronomerwhat had happened? 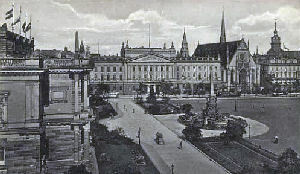 Seen prior to WWI is Leipzig University on the Augustusplatz (left), c.1910-12 from a scan of an old postcard in the author's collection. It was also the year that one of his more memorable charatcter traits would reveal itself: his temper. The results would supply history with another small and famous paragraph in the life of Tycho Brahe, but unlike all others, it was not in the science of astronomy but in the social and interpersonal violence involving men described as nobel or gentlemen: the duel. 2. I have been unable to ascertain whether or not Tycho saw the eclispe of 1560. His autobiography, "Mecanica" certainly remains silent on this point. In their time line, the rundetaarn.dk (Round Tower Observatory) website notes that "a partial solar eclipse occurs which, depending on the weather, would have been visible in Copenhagen; whether Tycho saw it or not we do not know, for he never mentions it in his writings." 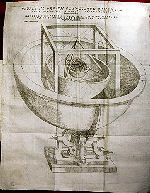 In Dreyer's technical biography of Tycho, he notes that "Though it was only a small eclipse at Copenhagen, it attracted the special attention of the youthful student..." wherein he references French philosopher and scientific chronicler Pierre Gassendi (January 22, 1592October 24, 1655) p.5, though Gassendi had not written from personal knowledge, see J. L. E. Dreyer's Tycho Brahe, p.13. 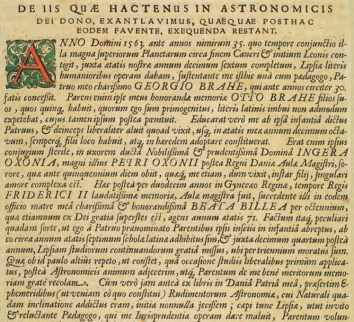 There is no doubt however, that Tycho's interest in astronomy was very much alive at this time for he purchased his first astronomy book during this period which is today located in the castle of Kronborg Library. See: Rundetaarn Observatory website. 3. 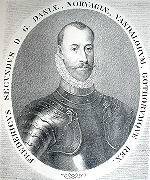 Anders Sørensen Vedel, in addition to being Tycho's tutor, was later reccognized for his ability as a poet based on a surviving text he wrote regarding Danish ballads. This volume was one of a handful of records and works that survived the fires of Copenhagen in 1728, a conflagration that destroyed the University of Copenhagen's library, along with many other irreplacable works of art, science, history, official records, several notable private collections and much of the observatory on top of Rundetårn, including the instruments and records of Tycho Brahe. The loss of all the early histroical records and cultural knowledge is still felt to this day. For more information see the article entitled Copenhagen Fire of 1728 at Wikipedia. 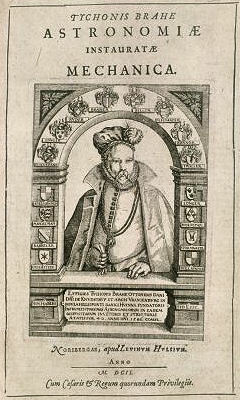 For additional historical background between Tycho Brahe and Anders Sørensen Vedel visit the article archives at Gangleri, The Northern tradition in the Renaissance, which focuses on the traditions of the Northern Euorpean esoteric Renaissance period, providing some well researched information not usually included in historical works on Tycho Brahe. Tycho Brahe Biography from Answers.com & Wikipedia. This article is licensed under the GNU Free Documentation License. It uses material from the Wikipedia article "Tycho Brahe"
Fowler, Michael Tycho Brahe, University of Virginia Physics, lecture notes from Physics 109, Galileo and Einstein, copyright © Michael Fowler 1996 except where otherwise noted, updated 2008. Retrieved June 07, 2009. BibliOdyssey Tycho Mechanica Friday, February 24, 2006, Creative Commons 2.5 Usage License & Terms Tycho Mechanica web page offers a colorful image collection of Tycho Brahe's instruments. Privately published in 1598, Astronomiæ Instauratæ Mechanica was actually intended to showcase Brahe's talents in order to secure further funding after a royal death and withdrawl of his allowance. The original woodcuts and engravings were hand coloured and the first trade printing, the year after Brahe's death, only differed by including a portrait of the author. See next page, bottom for a special section displaying these images. Astronomiæ instauratæ mechanica Tycho Brahes astronomical instruments Website of The Royal Library, Copenhagen. The instruments were built by Tycho Brahe and his staff between the 1570's and his death in 1601, many of them during his stay on the island of Hven (between 1576 and 1597). Petr Hadrava Tyn - the church in which Tycho Brahe is buried. This website provides a virtual walk in astronomical Prague. Tycho Brahe spent much of his life compiling the world's first truly accurate and complete set of astronomical tables and his work is only the more remarkable as he did so before the invention of the telescope!